Framework Communications (FWC) is a single-source Managed IT & Telecommunications Services Provider with a mission of reinventing technology by reinventing how technology is serviced. We focus on the client�s business needs and challenges and then design their support solutions to meet their needs and enable them to focus on running their business. FWC�s solutions include telephone systems, Managed IT Services, data backup & Disaster recovery, IT support, voice and data cabling, video conferencing, unified communications, hosted VoIP, cloud servers, and much more. FWC is an Avaya Business Partner certified on all Avaya & Nortel phone systems, including Avaya IP Office and Avaya Aura, and we also support Asterisk & Teo systems. FWC is also partnered with 35 voice and data service providers to ensure our clients receive the best value. We deliver an average savings of 30%! Visit our site www.fwccom.com to see case studies about how we found the savings to pay for clients� upgrades to their phone system and network. 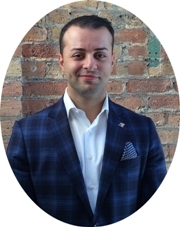 John Fakhoury is a proud Chicago Public School graduate, entrepreneur and do-gooder. A graduate of the University of Illinois, Urbana-Champaign, John founded Framework Communications in 2008 with the mission to reinvent technology by reinventing how people connected with technology. He is passionate and driven to deliver small and mid-sized businesses the opportunity to expand their business and grow via affordable, quality access to telecommunications and IT solutions previously only available to large businesses. A philanthropist and staunch supporter of local talent, John embraces any opportunity to use Framework Communications as a vehicle for good within the community. Framework Communications is a partner with Blue 1647, providing all the telecommunication services to the innovative think tank NPO on Chicago�s southwest side. John recently launched an internship initiative with his alma mater, Lane Tech, to provide students with greater access to technology. He also sits on the auxiliary board of Youth Outreach Services, a nonprofit dedicated to working with kids in urban communities to ensure their potential is reached. He�s an avid speaker, touring high school classrooms to share with students that their success is entirely in their hands. John, and Framework Communications have won the CityofCom Excellence in MSP Award Recipient and the Channel Partners 360 Top Ten winner 2013 and Top 3 in 2014. CEOCFO: Mr. Fakhoury, what is the basic concept at Framework Communications? Mr. Fakhoury: Rather than reinvent technological products themselves, we reinvent technology by reinventing how we connect our users with technology. We deliver world-class service to ease the minds of our clients, so that IT, which used to be a hurdle for most of our clients, becomes an asset and a differentiator for their success. That is ultimately what we are doing. Rather than reinventing the technology itself, we reinvent the technology so it works in our clients� best interest. CEOCFO: How does that translate into day to day action? Mr. Fakhoury: We work alongside our clients, whether they are in the medical, education, manufacturing, or nonprofit sectors to understand their business, understand the challenges that they face and what technology they need to employ to reach higher levels of success. Then we help them by supporting their day to day needs as well as acting as their day to day IT support council. We also keep our eyes on their long term goals, acting almost as a virtual CIO. This way, clients have the staffing of a large IT firm without having the burdens of costs and the inability to scale or having to concentrate on training folks and keeping them up with the latest and greatest. Ultimately, we outsource that burdensome costly headache for them and deliver a seamless experience both day to day while integrating long term considerations as well. CEOCFO: How do you deal with the challenge of understanding what a company really needs as compared with what they think they need and what they say they need and want? Mr. Fakhoury: That in itself is the million dollar question. It is the �what is the meaning of life� type of question in our business. My partner and I joke about this all the time. There is no real secret answer, but I think there are a couple of things that, if done well, are certainly able to help guide your clients. We are vendor agnostic. Oftentimes, many of our competitors may be a Cisco, Microsoft or Dell exclusive dealer, we don�t do that. Instead, we view our vendor partners and technology solution partners as tools in our tool belt. We really keep our clients best interest in mind. Then we really try to listen to their challenges, not necessarily from a technology perspective, but rather from a business impact perspective. Sometimes technology is cool and cute but oftentimes folks do not necessarily know what they need. We equate it to going to visit a physician. Most people can�t go to a physician and properly articulate the pain or struggle they�re experiencing; they can�t let their physician know, with authority, that they need a cat scan or an angioplasty or anything in between. Therefore, by thinking of IT in a similar way, and then by delivering our services properly, people that might buy from us because they like us and our concept, will continue to work with us because we�ve proven we deliver. That is really how we try to attack that question. Ultimately, we try to build that idiosyncratic relationship. Our clients know their business way better than I can ever know their business. We don�t, but we know technology. Therefore, we try to break down the challenges they face by bridging the value that technology can bring. That is where we separate ourselves. CEOCFO: Do you find that many of your clients take advantage of the full range of your services? Mr. Fakhoury: Framework feels we are meant to be concierge-type of service provider. Ultimately, we feel our clients don�t know what they do not know when it comes to technology. Therefore, it is really incumbent upon us to not necessarily push the latest and greatest service, but again, to work backwards from the client needs, the client�s challenges and the need for them to stay competitive. This is something we do very differently from our competitors, and there is a whole lot of overhead, which frankly is just not really tangible for folks to see sometimes. Oftentimes it is very difficult to provide that level of service. We commit to it and we painstakingly go through it. We have technical account managers that work alongside the clients and help them understand the problematic issues that they are facing, should they have repetitive tickets that impact their bottom line or otherwise. Therefore, we help them understand. By us learning more about their business from top to bottom, we are able to recommend more appropriate solutions to be able to bridge the gaps or the challenges that they are facing or that they may not even know that they are facing. And most of the time, our clients commit to a higher level of service with us as a result. Mr. Fakhoury: You know what? The moment we see a typical customer, the moment we view any customer as a typical customer, is the moment I go out of business. That is where we differentiate ourselves. Technology is arbitrary. Machines and computers are arbitrary. People are not. We reinvent technology by taking the phone in my hand, and other pieces of technology, and making it work more effectively for people. That is the difference. We cannot see clients as typical clients. We have to understand every client�s unique challenges. That is who we are. CEOCFO: Was this your philosophy from day one or has it developed over time? Mr. Fakhoury: It certainly has been reinforced over time. Framework was formed in a very �Branson-like�; very Virgin Airlines-like way. I was a young consultant and I could not get answers to technology questions that I needed to know in order to deliver service to the various Fortune 500 clients I was giving support. I thought, �There has to be a better way. This phone just does not work for me.� I was not a technology guru but I really saw the need in the market to provide personalized support and guidance to people. So I jumped in headfirst. And here we are. CEOCFO: When you are speaking with prospective customers, do they understand immediately? When do they realize the difference? Mr. Fakhoury: I think we separate ourselves because of our cultural approach in being vendor agnostic, putting clients first, empowering our people so they can put the client in perspective without being burdened by management or decision bureaucracy. Therefore, we have a really decentralized approach in that way. I know the difference has been felt by our clients when I get their positive calls and emails. I use the doctor example before. I have been in the operating room quite a number of times and I often joke that you only know a good doctor after you have seen a bad doctor. That holds true in our industry, our clients see the difference in how much we care and the approach that we take early on as opposed to our competitors. CEOCFO: Framework was recently recognized as a Channel Partner 360 winner. Would you tell us about that? That, to me, is an incredible commendation on us, not necessarily to management, but more so to our people. Our people delivering award-winning service daily. Conversely, while the Channel Partners Award was driven by our people, our most recent honor saw us named one of the 101 Best and Brightest Companies to work for in Chicago. This award is dear to my heart because it was our people saying, �We love working here because management takes care of us, we have the ability to be creative and to think independently.� We have training reimbursements and an emphasis on developing our folks, we have an unlimited vacation policy so our people can be taken care of and take care of their families, and we make sure they have the best healthcare plan that the state has to offer. We believe that when we take care of our people, our people go out and take care of our clients. Then we wind up winning the Channel Partner 360 award. CEOCFO: Does it surprise you that most companies do not understand that? Mr. Fakhoury: Yes! I think that is in most industries. As a kid trying to put myself through college, I was fortunate enough to gain employment at the Nordstrom shoe department. There, I learned a level of service that is not really met anywhere else, except for (hopefully) at Framework Communications. Nordstrom�s told me �Mr. Fakhoury, you are going to run into situations with clients or otherwise, whereby it is not going to be written in some manual how to proceed or what decision to make. However, this is who we are as an organization. We want you to do the best that you can do. You may make a mistake, but if you make the decision in line with whom we are as an organization, then that is all we can expect.� It was empowering and supportive and emphasized not to worry about making mistakes. In the day-to-day it�s easy to overlook that level of support and inverted pyramid culture but you have to put your eye on that broader picture and make sure your people are really taken care of. Lots of companies spanning various industries forget that and I am constantly surprised. Mr. Fakhoury: I think you might have an idea from the pitch in my voice and some of the answers that I gave you. I embarked on this about five and a half to almost six years ago at this point now. We have grown two thousand percent since 2010! We have been able to really move into a different arena and learn a ton about who we are. Certainly, the financial rewards and seeing the growth is always great. However, achieving the goals we put in front of ourselves and not only achieving those, but exceeding them and setting new ones has been really great! Quite frankly, business has been a dream! It is Christmas morning every day. CEOCFO: Why should people pay attention to Framework Communications? Mr. Fakhoury: We are not here to sell you the latest and greatest gizmo or gadget. We are here to listen to your needs, to listen to the issues you are facing and to give you an honest perspective on how to move forward and solve those considerations. It is who we are as an organization, and why we try to deliver a carefree experience.